The Digital Psychrometer Kit includes a compact humidity and temperature meter with a built in probe that includes wet bulb and dew point measurements for quick assessment of air moisture content. The included digital psychrometer simultaneously displays % relative humidity, temperature and dew point or web bulb or probe temperature. The digital psychrometers were designed to allow wet bulb measurements without slinging. The digital psychrometers calculate T1-T2 differential (air temperature minus external probe temperature) using the temperature probe and T2-dew point. The Digital Psychrometer Kit’s psychrometer incorporates data hold and auto power off features. 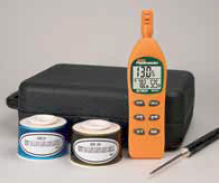 The digital psychrometers also store minimum and maximum readings. The digital psychrometers also allows the user to switch between °F and °C temperature units with 0.1° resolution. The digital psychrometers incorporate a unique sensor cap design that twists to a closed for protection during storage. The Digital Psychrometer Kit includes a RH300 psychrometer, external temperature probe, 33% and 75% calibration bottles, 2 AAA batteries and carrying case.